Do you have kids? If so, have you ever tried to teach them something? By this I mean something outside of not picking one’s nose, putting one’s fingers in sockets, or not running with scissors? If so, you are familiar with how much fun that can be. You know what I’m referring to – the eye rolls, the huffing breaths, or the stony-faced “I’m pretending to listen to you but what I’m really doing is imagining you being hit by a rogue meteorite” look. I’ve had some back issues recently, and as they have not abated, my saddle time has been limited and I’ve not really been able to do a whole. The silver lining part of this is that now, instead of concentrating on my own ride, I have a lot more time to nag the child while she rides her pony! YAY! Because that’s what kids love, right? Attentive and supportive parents? Yep, the past two times we’ve gone to the barn I’ve basically parked my big ol’ tuckus on Sugar, my Sainted Mare, and wandered around the ring exhorting the child to get her heels down, pull her shoulders back, take her legs off in downward transitions so as to avoid clashing aids, blah blah blah. As 10 year-old girls are pretty much hard-wired to ignore their mothers and mothers are pretty much guaranteed to go postal when ignored, you can see where this could go seriously sideways pretty quickly, can’t you? Picture the drive down to the barn: I’ve selected a a disk from the Bernie Traurig DVD The American Hunter/Jumper Forward Riding System that addresses some of Sophie and Cookie’s issues and it’s in the car’s DVD player. Bernie’s voice comes through the speakers a’ la the Voice of the Almighty Equestrian. When we get to the barn and we’re in the ring, we practice what Bernie told us about correct leg position (Sophie get your heels down — wrap your legs AROUND the pony) and make sure Cookie is paying attention to the leg aids. Bernie’s “hook up” correction, a little nudge with the spurs, is very effective and soon the pony is moving forward like she never had ideas otherwise. 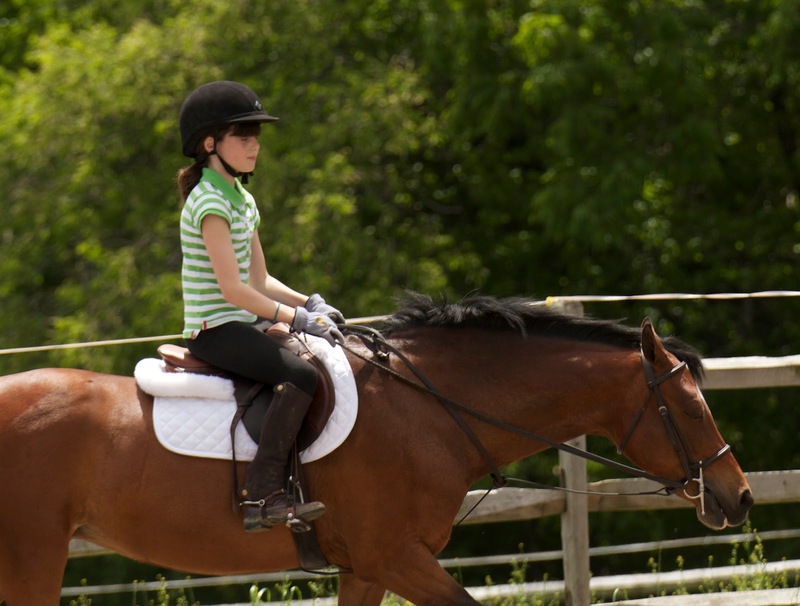 We work on keeping our lower leg still and not nagging the pony (perhaps why the pony was tuning out the kiddo’s aids in the first place, hmm??) and I keep them both guessing and sharpen up their transitions by playing a little Simon Says, a riff off an exercise I saw in a Sinead Halpin clinic. You know – Simon Says Trot, Simon Says lengthen the trot, Simon Says do a sitting trot circle, Simon Says canter, Simon Says Canter to Walk, Halt and Back up five steps. Simon Says Mommy feels like a complete eedjit and is in desperate need of an adult beverage. Thanks, Sug. I’m on it. Not everything went swimmingly, as you can imagine. I tend to overcommunicate (shocker!) and this can annoy the child (understatement! ), which results in the part where she rolls her eyes or blows me off and I raise my voice ever so slightly. Possibly more than slightly. Maybe enough so that folks in Delaware heard me (FYI -we’re in New Jersey). So we had a “discussion,” and some light drama from the pony jockey, which she thankfully got over quickly. We were able to work some more, get improvement on the issue causing the frustration, and call it a day. While we were untacking and grooming the girls, I asked Soph if her soccer coach ever spoke with her team about how a play went? Did he ask them what they thought went well, what needed improvement, and how they thought they could improve? Luckily (thank you, Sweet baby Jesus!) she said yes, and I was able to relate that concept to riding. How, as riders, we always need to be checking in with ourselves to see if our position is correct, to ascertain why a movement went well or went poorly (were our aids correct? ), and to determine any corrective steps we might need. I have no idea if any of this stuck with my daughter. For all I know, she dialed the Division of Child Services to report her crazy mother as soon as we got home. Additionally, I may have just undone 2 years of our trainer’s hard work. In which case, get me an adult beverage STAT, and then slap some duct tape over my piehole so I don’t get any more bright ideas! Oh well, if it hasn’t helped her riding at all, at least maybe I’ve earned some “Good Mom” points that will hold me in good stead during the teen years. Yeah, I hear you. Not bloody likely. Oh well, a Mom can dream, right? Hahaha thoroughly enjoyed this little piece. My little lady is only 7 months old but I’m already dreaming of being the pony club mum, the sponsored rides & shows together…!! Have to wait & see if we see eye to eye, what little girl doesn’t like ponies?… Right? Love that — no blood, no foul! Loved this post Amy! You are always entertaining. Keep ’em coming! Oh my gosh, I laughed so hard when I read this! I am just now recovering from a broken leg that I got 2 weeks after we bought a new horse, leaving my 12 year old to do all the riding. Since I’ve been watching a lot of riding instructional videos lately in my free time, I feel compelled to pass on this newly gained info to my poor daughter, who pretty much rides better than me already. So I loved reading this and can totally relate to it! Lol! Love. I have been in a partnership w my daughter since she was 12. That was 17 years ago. Had she “listened” to me, I am fairly certain we would have gotten to advanced two years earlier, with great dressage scores. I can so feel your pain…oh, and dont let anyone fool you…..they do NOT get over this! Wonderful piece! My twin girls are just turning 9, can’t wait for all the eyerolls I have to look forward to! For now I’m leaving them to two instructors who both have much more patience and tact than I. And I thought we were the only ones who called them po-pos! The one part you didn’t mention, that I’m guessing we’ve both experienced, is that I have quickly dropped from full cool mom status in the eyes of the other kids at the barn (because I ride Jumpers and make the cool riding shirts) to The Mom From Hell status, in about one week – and now likely to forever be there. Like sisters from another mother! Aren’t you the best for spreading the word – thank you!! My pleasure — I ADORE my belt, and the kids LOVES the wraps you so kindly added.